Is Dell ditching Windows RT with XPS 10 sale stoppage? The Dell XPS 10 isn't the best tablet on the market, and Windows RT didn't do it any favors in gaining traction. It seems like Dell has noticed this and decided to discontinue the 8-inch slate, but whether this move is for good is still up in the air. When visiting the XPS 10 purchase page on Dell's site, users are confronted with the message, "This product is unavailable. 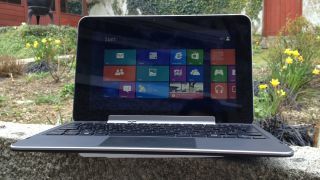 Below we have suggested a comparable system," pointing to the Dell Latitude 10, which runs the full Windows 8. We asked Dell for a comment on the missing XPS 10, and though they wouldn't confirm or deny the permanence of the tablet's disappearance. However, the rep did say, "We're going to be announcing our full tablet portfolio at our event in New York next week [Oct. 2] and will be providing full details then." It looks like we'll have to wait until October to find out the tablet's fate, plus where it stands on Windows RT. During IDF a few weeks ago, Dell outed a new tablet, the Venue 8 Pro, running the latest Windows 8.1 OS. We're in for more next week, but it looks like Dell is shifting its focus to newer, and better, OSes. Speaking of Windows, we had some hands ons time with Microsoft's Surface 2 and Surface Pro 2.